Are you working on a project/assignment for the class and need to use computer room software such as SPSS, MATLAB? You don’t have to go to computer rooms to do your homework. ICTO’s Virtual Computer Room service allows you to use computer software at home. Virtual Computer Room is a remote access service that allows staff and students to use their own computers anywhere to get access to University-licensed software via Internet for teaching and learning purpose. 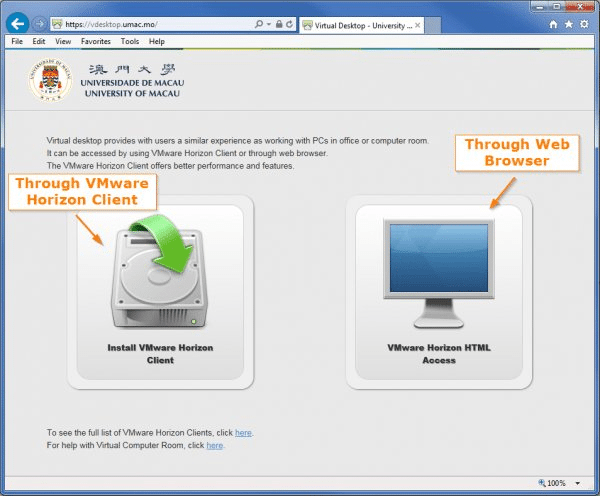 Using your UMPASS user ID and password, you can access Virtual Computer Room at https://vdesktop.umac.mo by using web browser or VMware Horizon Client to gain access to a range of software that is normally only available for use in our computer rooms, such as SPSS, MATLAB, EViews. How to access Virtual Computer Room from web browser? How to access Virtual Computer Room from Windows VMware Horizon Client? How to access Virtual Computer Room from Mac VMware Horizon Client? Currently there are 35 virtual computers installed with English Windows on a first come, first served basis. Supported Browser: Chrome 38 or later / Firefox 33 or later / IE 11 / Safari 6.2 or later. You can only connect 1 session at a time for maximum 2 hours. A reminder will display on screen 10 minutes before the session ends. For more information, please visit ICTO Knowledge Base.